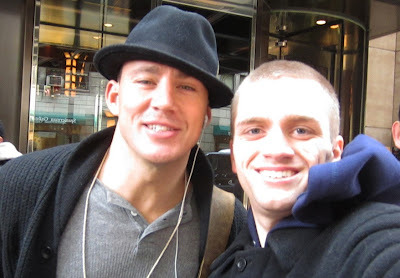 This past winter, I met current superstar Channing Tatum, who had the biggest year of any actor in Hollywood. Channing was in town for Saturday Night Live, and we arrived at a spot we knew he was staying, to try and meet him. After waiting a little while, he exited the spot, and was rushed by about 12 fans. Channing said he was late, but he still made sure each and every fan was taken care of. I got a photo with him, and had him sign a Fighting mini poster. I am so glad I got him when I did, since crowds have grown for him after his success with The Vow, 21 Jump Street and Magic Mike, which has propelled him atop the A-List."